Na Nach Nachma Nachman Meuman: A Nanach a day keeps the Rabbi away! A Nanach a day keeps the Rabbi away! B"H Nanach is rising higher and higher. Recently the Nanach formed a political party to gain representation in the Israeli Knesset, approximately 2100 people voted Nanach!!! Although on the one hand this looks like a travesty and betrayal that the Jewish People forsook the true tzadik, the truth is that an estimated 50-90% of the population were not aware that the Nanach were running. The political party had almost no financing what-so-ever. Even still they were highly successful putting Saba Yisroel on TV numerous times, on the radio, and other general hafatza, including hundreds of thousands of stickers and fliers. The party also successfully challenged many peoples loyalties, forcing them to consider their true standing with Rabbainu.... Over 2000 people said that they didn't care about anything - not satmar/neturai karta, not the so called breslov rabbis or even friendly gossip, nor any of the promises and false hopes of the politicians of the right left and center - and their rabbis and their rabbi's rabbis, and their rabbi's rabbi's bubby, and not withstanding the uncircumvential deficiencies of the only human Nanach running the party - or any other temptation or conspiracies - they put their fate and confidence with Rabbainu, period. B"H right now the party is regrouping. In recent years, more and more Nanach are going to Uman for Purim, Purim is the time to defeat Amalaik, and Rabbi Nussun makes it clear in Likutay Halachos that settling for any rabbi other than rabbainu, is the work of amalaik, so obviously it is a very propitious time to be by Rabbainu. Also Rabbainu revealed that although in previous good times the beginnings were from Passover, in present good times all beginnings are from Purim, so what better way to start than by Rabbainu. The Nanach feel somewhat powerless in face of the terrible plight the holy tomb of Rabbi Nachman flounders. Besides for the fact that Rabbainu's rightful burial place should be in Jerusalem (outside of the actual city - where it is forbidden to bury people...), Rabbi Nachman's holy tomb should be a central attraction for the whole world, where people flock to sing Na Nach Nachma Nachman MeUman and gain eternal rectification, but alas the holy tomb is hostage to the different rabbis who want to force everyone to take on their myopic haredi agenda. May the world merit to see the outbreak and ascension of Na Nach Nachma Nachman MeUman from Uman and from Zion, may it be soon, may it be in our days, it will be Nanach, amen! 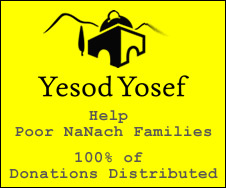 The Nanach community, or as it is called sometimes (facebook) the Nanach Nation of Monsey is B"H growing stronger. There is talk of getting a Nanach vehicle, and there are frequent gatherings and Nanach events. Get involved. Recently I had the pleasure of discovering yet another American Nanach who was with Saba Yisroel for an extended period of time, and I've uploaded a video of his rendition of Azamir Bishvuchin on a harp, onto the youtube. It wasn't until years after Saba's departure from this world, that Moshe Cohen gained the Nanach understanding sufficiently to break away from his Kabalist rabbis, and adopt the "strict" - i.e. lenient - practices of Nanach. Nanach.net is working on fixing up its amazing free music site by transferring it to a better platform to give the world easier access and a more amiable experience, possible even interactive, and other potential venues B"H.
Nanach.net is also working on procuring a translator for the holy books of Rabbainu so as to make them accessible to the English speaking public, for FREE (at least online, and then B"H we'll work on the publication). Nanach.net, as usual, encourages everyone to get out there and Nanach - show them what you got, show them what Rabbainu is all about. The life you save will be in addition to your own. Anyone wishing to pursue the Nanach smicha plan, is encouraged to drop such plans, and to adopt the holy ways of Nanach humility and thanksgiving. Anyone who can donate or direct us to where a Nanach laser projector can be obtained, to shine and project Nanach on the Kotel, should come forward, discretely. As for translations... Please work on Liktei Aitzos, that is the #1 book I would love to see a good translation of. ebay for the lazer projector. ebay.com that is.